Here majority of Just Right’s business comes from customers like you – people who need personal storage units for all types of items. Waiting for your home to be built? Shopping for your dream home? Traveling or working away from home for an extended period of time? Whatever your reason, we can handle whatever you need to store. We have personal storage units for all types of items. Need some help figuring out how much space you need? Check our storage unit sizes for helpful descriptions of our locker sizes and what they can hold. Just Right Self Storage offers you convenient and hassle-free personal self storage solutions for your personal self storage needs. We help you create space so that you can focus on what matters most. Our self storage facility in Ottawa is an extension of your garage, your attic, and your home. Our clean, bright, secure facility is a great place to store your belongings during a renovation or while you’re downsizing or moving. If you want to truly expand your home’s space, consider us for longer-term residential storage of your household goods, furniture, or other personal items. It’s your space and your peace of mind; we are here to make your residential storage easy and hassle-free. Our climate controlled residential storage units come in all sizes ranging from 25 to 300 square feet. Additionally, our storage facility has advanced security features, including state-of-the-art security systems such as 24-hour digital video surveillance, computer-controlled secure access and a sheltered drive-thru lane for easy and secure access to your belongings. We make sure that your goods are safe so that you can enjoy peace of mind knowing that your goods are secure. 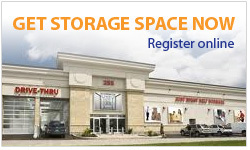 Our storage facility in Ottawa is specifically designed for ease of access to your storage unit. We offer 24/7 secure access with your electronic pass and drive-thru access to avoid bad weather. Additionally we can provide you with a free truck to move your goods into your storage unit. Visit our convenient downtown Ottawa location and you’ll find friendly, helpful staff and a wide variety of moving and packing supplies in Ottawa such as boxes, tape, bubble wrap and mattress bags at affordable prices! Call us today at 613-567-3333 and speak with one of our experienced self storage experts. Together we will work with you to determine the best storage solution for your personal storage needs. From the moment you call, to the moment you bring your goods to our secure self storage facility our goal is help you easily create extra space in your home and fulfill your residential storage needs so that you can focus on what matters to you. You’re in good hands with Just Right Self Storage!